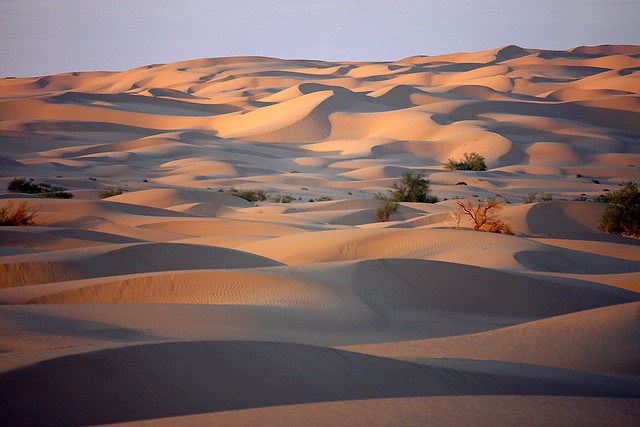 Dunes at daybreakat the Imperial Sand Dunes in California near the Arizona border; photo by cobalt123 on Flickr (noncommercial use permitted with attribution / share alike). The official position of Poet Laureate of California was created under Assembly Bill 113, signed in 2001 by then-Governor Gray Davis. The unofficial position of poet laureate was established with the appointment of Ina Donna Coolbrith on June 30, 1915. (c) The arts generally have been shown to have a positive impact on the ability of our children to learn, to create greater interest in academic programs, and to enrich and enliven the great cultural heritage of California. (d) California's poets have long been acknowledged as among the most prestigious in the nation, and include numerous Nobel Prize, Pulitzer Prize, National Book Award, and other significant award recipients, and at least three United States' Poets Laureate. California's poets also come from every ethnic, religious, and geographic region of the state, and have often provided a great source of inspiration to their communities, students and other young people, and the people of California generally. (e) The California Poets in the Schools program, in which professional poets work with children in Kindergarten through 12th grade in almost every county in the state, has created great interest in the poetic arts among California's children and youth. This interest is evidenced by the large number of reading series, chapbook publications, poetry-based Web sites, which have among the largest number of "hits" of all Web site types, and other popular poetic activities.